Sangmin is in Lugano, Switzerland this week to present his new paper on Griffin at ISSTA, the 2013 International Symposium on Software Testing and Analysis. Griffin is a tool that aims to help programmers find bugs in their concurrent software. Congrats, Sangmin! Sangmin Park, Mary Jean Harrold, and Richard Vuduc. “Griffin: Grouping suspicious memory-access patterns to improve understanding of concurrency bugs.” In Proceedings of the International Symposium on Software Testing and Analysis (ISSTA), Lugano, Switzerland, July 15-20, 2013. 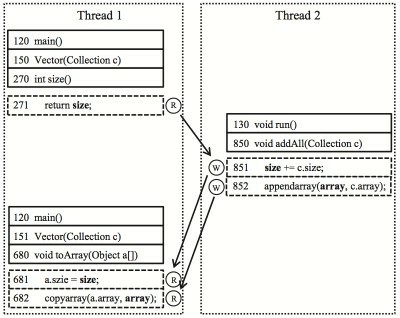 A bug graph, one of Griffin’s aids for programmers who need to debug their concurrent software.